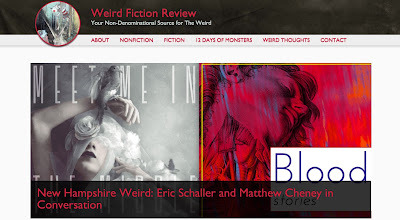 The marvelous Weird Fiction Review website has now posted a conversation that Eric Schaller and I had about our books, our magazine The Revelator, the weirdness of New Hampshire, and other topics. Along with this, WFR has posted Eric's story "Voices Carry" (originally in Shadows & Tall Trees) and my story "The Lake" (originally in Lady Churchill's Rosebud Wristlet). So if you're curious about us or our writings (or just utterly bored), Weird Fiction Review is a great place to start. I'm thrilled that my A Cappella Zoo story "Killing Fairies" has just been reprinted in Best Gay Stories 2016 edited by Steve Berman for Lethe Press. The table of contents for Best Gay Stories this year is quite strong, and it's an honor to be among this company. It's especially nice to have my story in a book with a story by Richard Bowes, since "Killing Fairies" is my attempt to write Bowesian tale: something that skirts the line between fiction and memoir. In this case, I wanted to preserve a few memories of my first year of college before those memories slip away (they grow dimmer and dimmer), and I thought a fun way to do that would be to give myself the challenge of trying to write like Rick. We talked about Texas Chainsaw Massacre, The Sublime, writing advice, writers we like, Michael Haneke, neoliberalism, The Witch, and all sorts of other things. It was a lot of fun and we could have gone on at twice the length, but eventually we had to return to our lives. Many thanks to Electric Lit for being so welcoming. I have been busy and have neglected this blog. I forgot to make a post here about some of the most exciting news of my year: I have a story in the current issue of my favorite literary magazine, Conjunctions. It's titled "Mass" and it is about, among other things, a mass shooting. Early this morning, at least 50 people were killed and 53 wounded in a gay nightclub in Orlando, Florida. The New York Times is currently calling this the deadliest mass shooting in U.S. history. 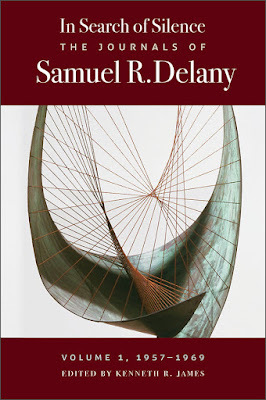 Kenneth James is editing the journals of Samuel Delany for publication. Volume 1 is coming out from Wesleyan University Press in December. For the future volumes, Ken needs help with funding. If you already know how valuable this project is, don't read on. Just go donate.